Outlook Financial and its parent company Assiniboine Credit Union have joined ding free, a nation-wide movement promoting the national connection between credit union ATMs. Credit union members (including Outlook Financial members) can now perform various transactions free from surcharges at ACCULink® ATMs across Canada. Even excluding the relatively small number of credit unions that are not part of the ACCULink ATM network, Canadian credit unions now offer over 1,800 surcharge-free ATMs from BC to Newfoundland. That's a bigger ATM network than most banks! And it's all ding free. 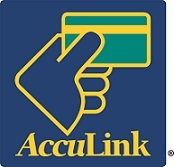 Since not all credit union ATMs are on the ACCULink network, it's important that Outlook members look for the ACCULink logo. If it's ACCULink, it's ding free. And with the ding free locator app, available for Android, iPhone, Windows and Blackberry devices, you can find the closest ding free ATM wherever you are in Canada.